Happy Birthday to Andy Jones! He may be 64 but the veteran opener was still only third eldest of a crack London Saints team that lined up for our annual last match of the season at Ex-Blues on a sunny day in Kent. Jonesy (photo: bottom, right) is younger than his seated neighbours, John Smith (65) and Tony Grimes (77). But experience was allied to youth in the form of Ben Sherriff (18), who brought the average age of the squad down to a sprightly 54. The years rolled back from the first ball when Ex-Blues opener Rughers was bowled by frisky Phil Rogers (52), whose opening spell of seam bowling was superb. The records don’t tell if a 0-1 score off one ball was a first, and soon it was 4-3 with Phil and Paul Jackson (45) picking up further wickets. It was already a day of surprises, with the season’s Duck Trophy champion elect John Griffiths pulling out earlier, citing a dodgy pork-based paella. “A nasty bout of the runs,” said duckster JG. “We wish,” said skipper Dave Thomas (58). Less of JG’s bowels: more about Phil’s balls. 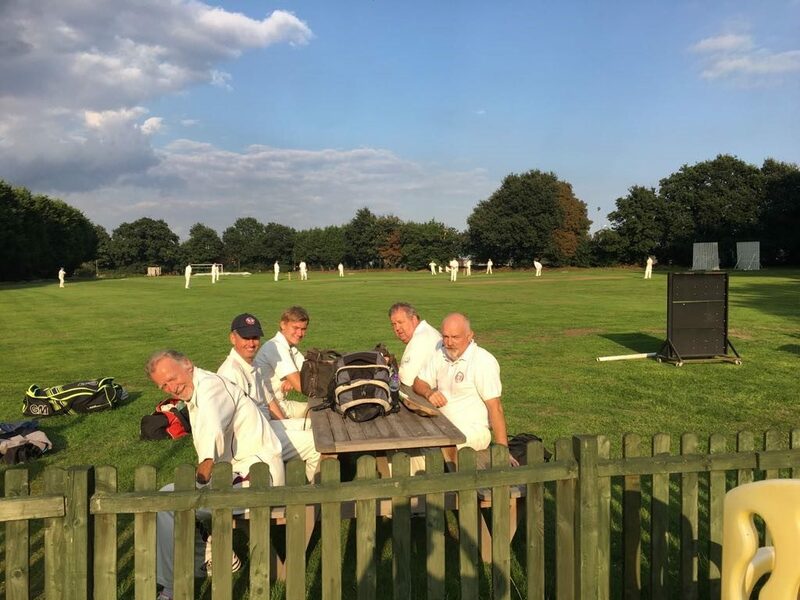 A superb return of 6-3-7-3 inspired the team to new heights – in the case of Neil Hotston (56), a steepling catch to dismiss dangerous Harris, which nobody thought he would take, least of all Neil. Birthday boy Andy then celebrated with a sharp stumping and Ex-Blues were reeling at 78-5 – which prompted Jonesy to utter the immortal words: “At this stage, it is increasingly unlikely to see how we could lose this game.” Doh! Naturally inspired, Ex-Blues regrouped and despite DT taking three good wickets, the tail wagged strongly, adding 108 for the last two wickets. A very respectable 222-9 was posted, with Danks just failing to make his maiden 50- despite Ex-Blues adding at least three overs in a timed game! Just before the interval, another LSCC veteran, Trevor Mayhew (50) turned up for a cup of tea and was immediately selected to replace Pork Paella. “I don’t want to open,” said Trev, who was promptly told to pad up by DT. The opening partnership of Jonesey and Trev (114: years, not runs) unravelled fairly quickly, when Andy’s first decent shot went straight to the hands of a fielder. The scorebook recorded 0 but an affronted AJ insisted he’d nicked a leg-bye. “You can’t give him a duck on his birthday,” argued Jacko, hardly a cricket argument but, as Lennon/McCartney wrote, we do still need him at 64 (Ex-Blues also fed him veggie burgers. Bless them). More years rolled back as the Mayhew brothers joined up at the crease, another surprise ensuing when Andy Mayhew (52) inexplicably hit his first ball for six. It was even more suprising than when DT ran out Barham in the Ex-Blues innings and Andy (who had replaced Jonsey as wicket keeper) claimed a stumping. 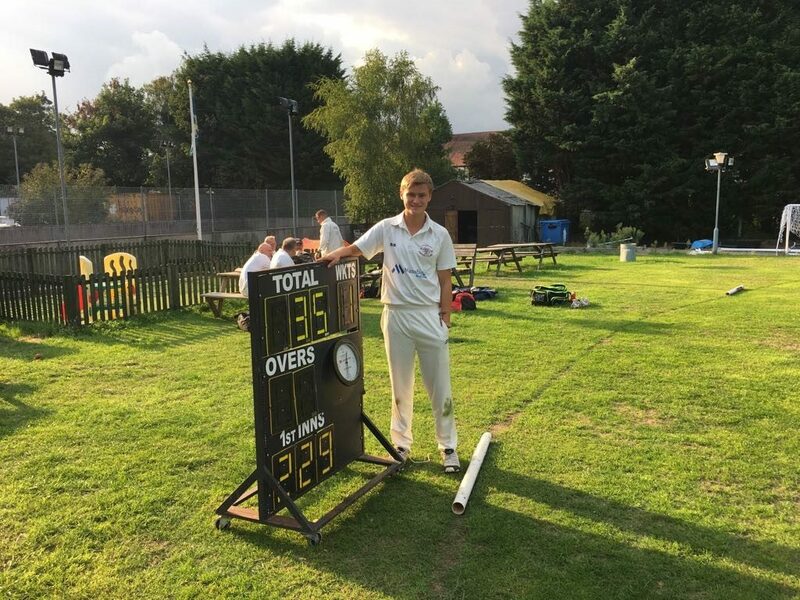 Spookily, Andy had told his brother the previous evening: “All I want to do is hit one more six.” Not only that, the brothers were just three short of scoring 100 between them as the game lurched heavily into LSCC’s favour. With 20 overs to go, we were 118-3 needing 105 for victory – less than a run a ball. Cue the collapse. Mark QE2 Barber (56) scored five off one ball then was out, followed by a Hilda (three ducks in a row). Neil, Ben and Phil all fell to the deadly accuracy of slow bowler Stuart Dilley, who finished with 4-1-5-3. The total was 140-8 and the required run rate now more than eight an over. There was time for one more surprise. DT recorded his highest ever score, 66, in July 1990 – before Ben Sherriff was born. But coming in at No9, in the failing light, he played like a young Il Duce with a series of boundaries, ably supported by No10 Tony Grimes. The pair put on 66, at one stage looking as if they might nick the game. They didn’t – but finished just 16 short of the Ex-Blues total while heading into the LSCC record books as the second-highest ninth wicket partnership. Which DT did, along with many others. Well played the team and thanks to Ex-Blues for the game, barbecue and great spirit. 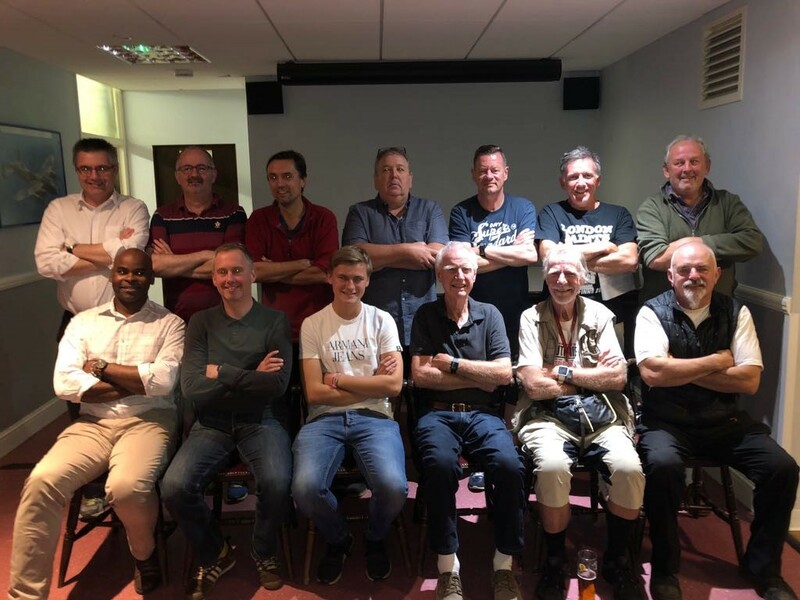 Man of the match: Many contenders, not least Trevor’s rapid switch from interested spectator to half centurion; Andy’s 45 (including that six) and outrageous claim for a stumping, and Phil’s brilliant open bowling spell. But it has to go to DT for his three wickets, half-century and need to be loved at this stage of the season so that he does it all again next year. 1) On the platform at London Bridge, a man waved through the train window towards Tony, who enthusiastically waved back. A woman behind Tony said he was actually waving at her. 2) Andy Mayhew’s six off his first ball. We’ve never seen anything like it. 3) Phil Roger’s wicket off his first ball. That’s never happened to LSCC. But the winner is: Andy Jones, who in a kindly spirit ‘volunteered’ John Smith to help him collect the boundary markers. The couple were over halfway around the pitch with armfuls of white plastic when an Ex-Blues player told them the markers needed to be left out because there was a match the next day. Player of the season: Congratulations to David (One Liner) Nanton! In a close vote, David won eight votes, two ahead of Phil Rogers (with one each for DT and Andy Mayhew). 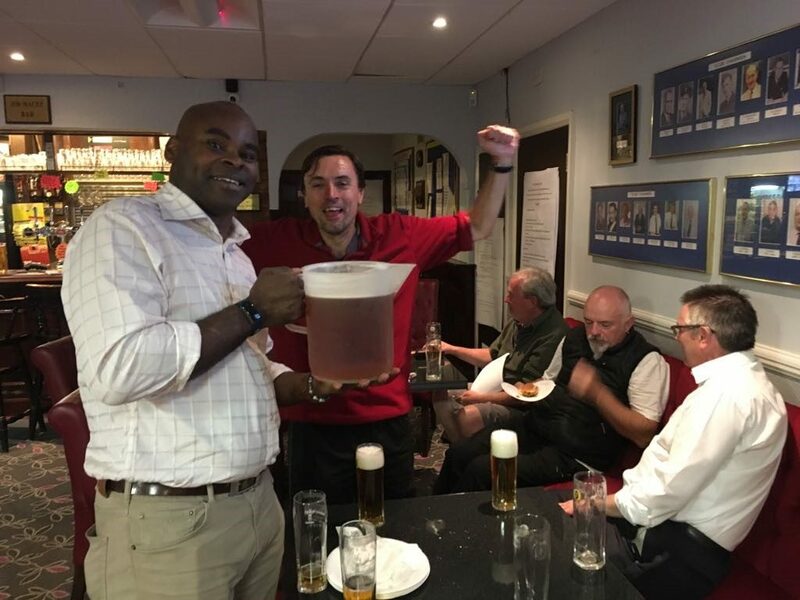 One Liner took 14 wickets in the season and was a deserved first-time winner of the title – and he even bought a jug! Thanks for coming down for the evening David.